As the semester winds down, I’m sure a lot of you are doing the same thing that I always do: plan what you’ll change for next time. Especially in May, when the next semester is so far off (if you’re not teaching summer classes), I love to spend entire days just re-working the things that didn’t work this time around. 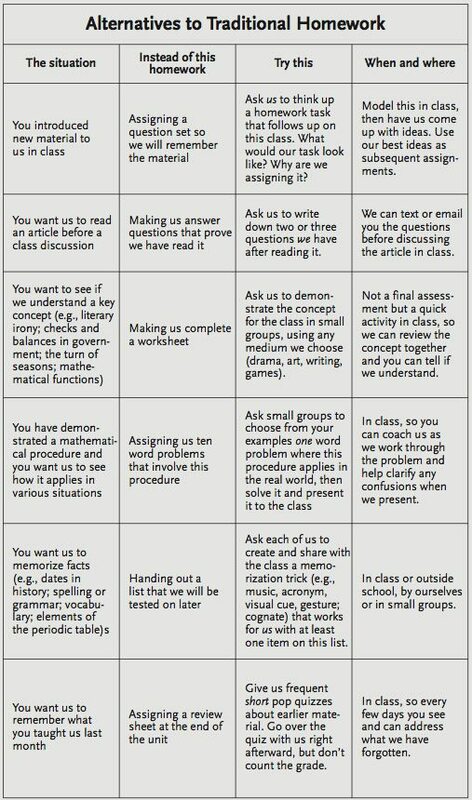 So if you are like me, and you’re looking for ways to change things up a bit, here is a chart of alternatives to the traditional homework assignment (courtesy of te@chthought, who credit Kathleen Cushman).